Thought they changed that law? 8am now, or got rid of it completely. I have definitely bought alcohol before noon on sunday in new york the last few years. While I believe you can buy beer before noon on Sundays in a package store (i.e. - Beer distributor, convenience store, grocery store), you still cannot be served alcohol before noon on Sunday in a bar or restaurant. 20-Game Saturday Plan, Prom Box 423. New York Governor Andrew Cuomo signed into law a bill that allows restaurants and bars to start serving alcohol at 10 a.m. on Sundays, easing restrictions set by 80-year-old blue laws. Restaurants were previously required them to wait until noon before selling alcoholic beverages. "The Brunch Bill," as it's been dubbed, will also let restaurants outside New York City apply for one-day permits allowing them to serve drinks as early as 8 a.m. for special events. Why there is still any kind of law like this at all is head scratching. Who's the lobby group FOR the restrictions? It's not like you can say it's to curb public drunkenness, when it only affects bars and restaurants up to 10AM on Sunday... How early do these places even open on Sunday? Maybe 7AM for breakfast? So... They want to head off that spike in drunks getting up that early from their legal Saturday night benders, looking to booze up between 7AM and 10AM? Also "fun": perusing a summary of the history of New York City "Blue Laws" shows that a Reds/Giants baseball game at the Polo Grounds in 1919 was halted and prosecuted for playing baseball on a Sunday afternoon! People don't want New York to turn into New Orleans? And who are these "people"? I seriously never hear anybody express anything positive about the Blue Laws, or how they're the only thing saving us from some kind of outbreak of drunkenness on Sunday in particular (if anything, I assume this only encourages heavier drinking on Saturday nights, "to get them in" for the dry spell a-coming). It's simply a burden on enforcement, I would imagine. There must be cops out there trying to catch "early drink sellers" or this kind of law would simply be ignored and unenforced, the way jaywalking laws are in Manhattan. Now that is new to me. I will have to look that up! 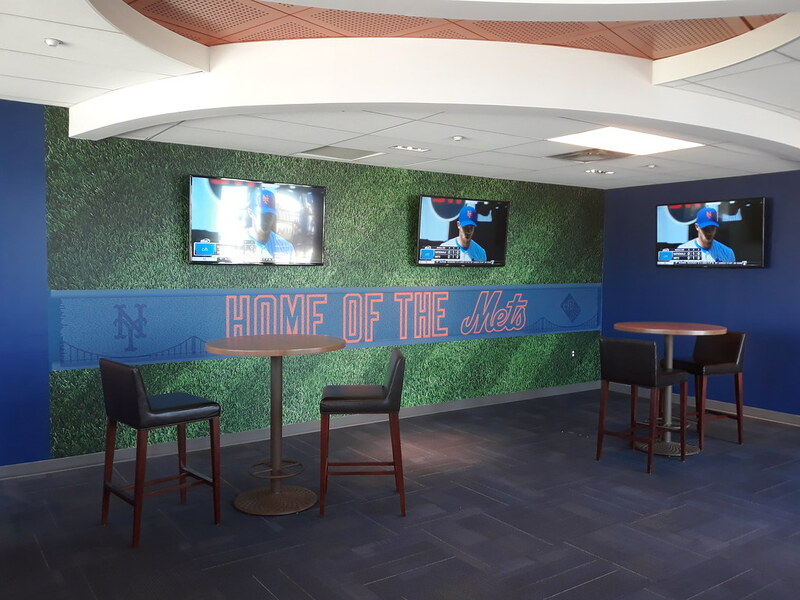 I also remember not being able to buy beer at a Sunday day game at Shea and Citi Field until after 12 noon, but I have had no problems at Citi Field upon gates opening at 11:10am on Sundays. Whether or not a putative scenario of gates opening at 9:10am or 9:40am on a Sunday for some reason would have problems, I don't know. Sometime after Fred hijacked the team, Banner Day was discontinued. They had it in 2012. I think they also had it in 2013. Last edited by Gary Dunaier; 04-08-2019, 08:06 PM. Found my name on the dugout roof. In the below image I've circled it in red and inserted an enlargement at the bottom so you can actually see it. Yes, the names are that small. If you want to find your name but can't get to the dugout during batting practice - and I don't know if they're officially letting people down there to see their names, or if I was just lucky (no, I didn't play a Thumbs Down Guy card) - they have a replica on the wall of the Season Ticket Holders Clubhouse. Tried to walk down sec 122 during batting practice to see the dugout and an usher wouldn't let me through. I told him I wanted to get a look at the names on the dugout and he said he has no clue what I was talking about. Then he told me I could go down section 129 in the left field corner.. Smh.. Going tonight. I’ll try to get down there if I’m early. Looks like the names are on both the home and away dugouts from the previous photos. Since in first part of alphabet will try home dugout first. I didn't know that "Clubhouse" was a thing until I stumbled across it on Sunday, while walking around to see where stuff got moved to (the Fuku Chicken is now back there next to the Kiddie Field). It was dark, locked, and empty though. When did you see it operating? If it wasn't open in the 4th inning of a weekend day game, when is it open? 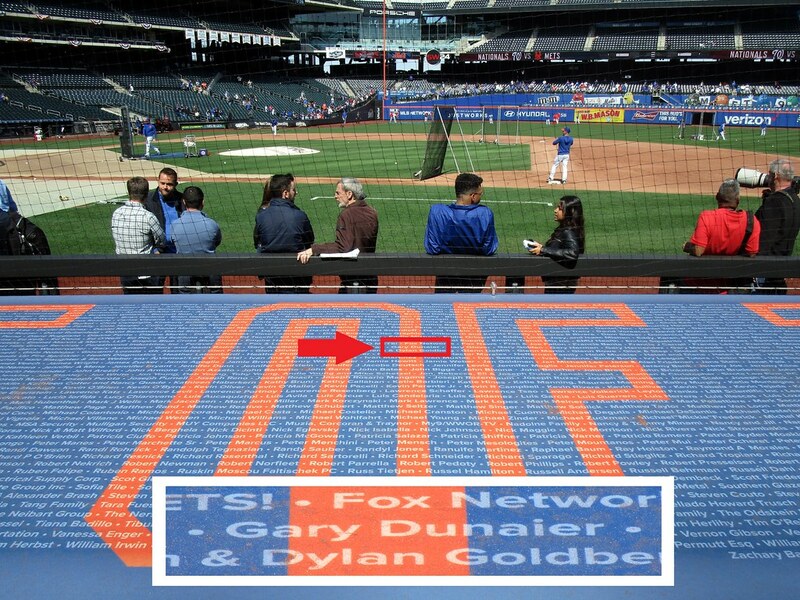 And, is the dugout stenciling the same on both sides, or is your name only on the 1B side but not the 3B side? Here's a shot I took of Pete Alonso in the dugout, standing in front of the part of the section of the dugout that has my name on it. By itself, that would be cool enough for me, especially because I've become a Pete Alonso fan (as have many of you, I'd guess). 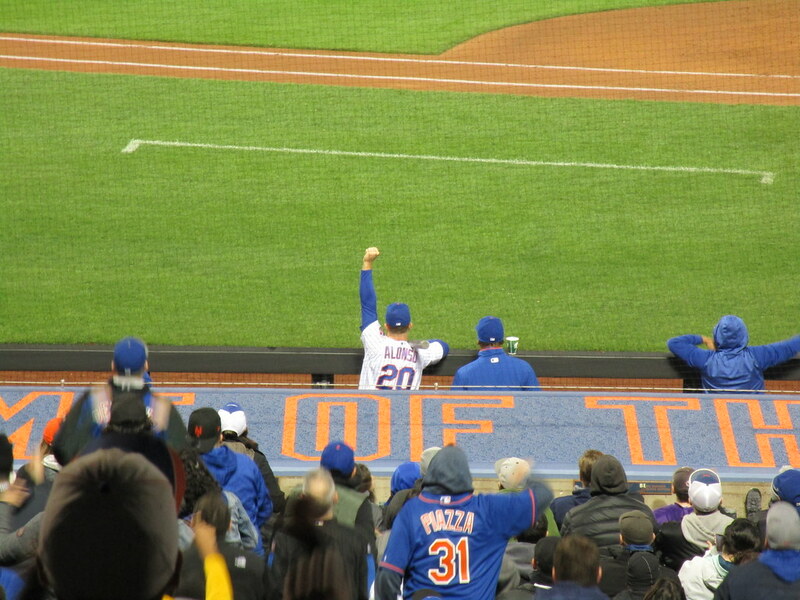 But what makes this shot great is that I happened to catch him pumping his arm in celebration as he reacts to Amed Rosario's game-tying RBI double in the bottom of the second inning during last Tuesday's game (4/9/19 v. Minnesota). I think Rosario had just made contact with the ball at that moment. Some people may be disappointed with the placement of their names on the dugout roof because, as you can see, the canvas on which the names appear stretches over the side, and some of the names fall off the roof and onto the side of the dugout. 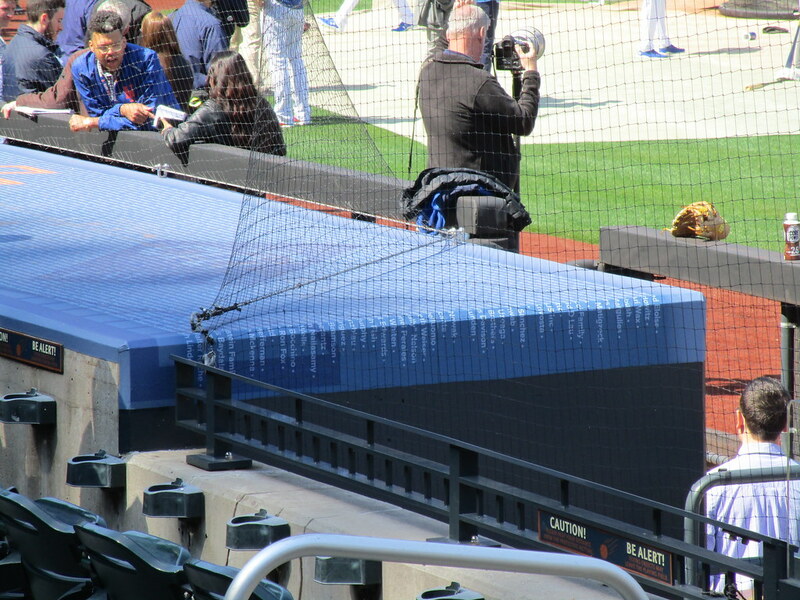 Also, some of the names may be difficult to see or photograph because at the far end of the dugout, the protective netting angles back from the front of the dugout to the first row of seats.